One doesn't find these 6 1/2 to 7 inch tall vases very often. There is even an 8 1/4″ vase known, as well as handled trays. Pictured are the blown vases and most have wheel-cut designs of balloons around the center. Some have other designs and some are plain. The six-inch version of the vase was simply called #771. 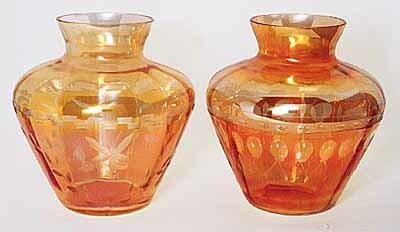 These vases are shown in some of the Imperial catalogs in three forms and the term Lustre Iridescent has been associated with these pieces (i.e., Imperial Glass Encyclopedia, Volume II, ed. James Measell). They always have shiny iridescence, so they would likely be one of Imperial's lustre Iridescent colors — Nuruby (marigold), Sapphire (smoke), Peacock (kind of a multicolored marigold), and Purple Glaze (a darker, more wisteria color). All four colors have been seen, but they can be difficult to separate out, depending on how heavy the dope was applied. The server was press molded and the vases were blown molded. The rib optic inside the blown molded vases was achieved by first dipping the initial bubble (called a seed) of glass into a ribbed mold. This puts the ribs on the outside, but when the piece is blown to its final shape the ribs move to the inside to give the ribbed effect.